Quartzsite is a town in La Paz, County Arizona, located about 125 miles west of Phoenix on I-10. With a population of just a few thousand people, Quartzsite really comes alive during the winter in January and February when thousands of rock, gem, fossil, and gold collectors converge on the small town for a series of mineral shows. It is quite possibly the most popular area in the United States for “snowbirds” to visit with their RV’s during the winter months. The other attractive thing about Quartzsite is the rich gold mining history and abundant prospecting opportunities that can be found in this area. It sits right in the middle of some great gold country, and gold can be found in many of the desert washes and gulches in this part of western Arizona. Since there is a serious lack of water here, the most popular prospecting methods are drywashing, and in areas that produce nugget sized gold, metal detecting is also a very good way to search for gold. A few miles southwest of Quartzsite is La Cholla mining district located on the eastern side of the Dome Rock Mountains. A good amount of prospecting has taken place around Sugarloaf Peak and La Cholla Mountain. Just about any dry gulch in this area will produce some gold. Another good area near Quartzsite is the La Paz placers on the western side of the Dome Rock Mountains. The richest area is around Goodman Wash, La Paz Wash, and the general area between La Paz Mountain and I-10. Much of this area is off limits to prospecting because the land resides on the Colorado River Indian Reservation. Just a few miles west of Quartzsite are the Middle Camp gold placers. This area was worked extensively for many years, primarily in the areas from Middle Camp Mountain and Marquitta Pass south to Interstate 10. The extensive prospecting that has taken place in this mining district is clearly visible today and will still produce some gold by drywashing and metal detecting. The Plomosa mining district is about 8 miles east of Quartzsite toward Elephant Back Mountain. Both lode and placer mining was prominent in this area, with the richest areas located at Plomosa Wash and Smith Wash. More mining can be found just over the hill to the east in Apache Wash. This is a very rich area that will produce gold in most of the washes and gulches. 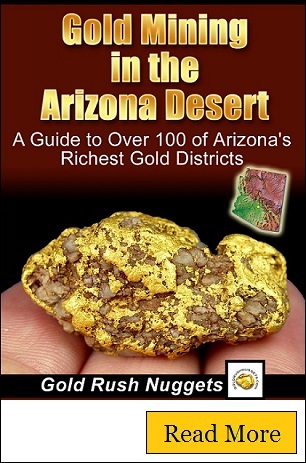 Much of the gold that is found throughout Quartzsite and other areas in the desert Southwest are very widespread and will show less evidence of past mining than the more prominent gold mining districts mentioned above. It is always smart to look for these old historic diggings as an indicator of where to search for gold, but keep a sharp eye and look for smaller, lesser known prospecting areas that may have been overlooked by others. Small drywash piles are great indicators for areas that gold can be found today. Using a metal detector to scan old workings can also be very productive.